It's been a long six months since NVIDIA's announcement of the GeForce RTX 20-series at Gamescom. With the launch of the GeForce RTX 2060 last month that range is effectively complete, and in the absence of more affordable options the ageing GTX 10-series now serves as a stop-gap in the sub-£300 market. Price drops have made that market exceptionally competitive, but it cries out for a next-generation GPU that can take advantage of some, if not all, of the features NVIDIA's Turing architecture has to offer. Today marks the launch of the Geforce GTX 1660 Ti, starting at an MSRP of $279/£259.99. If you're expecting a re-badge part you'd be (happily) disappointed as this new card is the first to incorporate brand new silicon. In NVIDIA's product stack it largely replaces the GTX 1060 6GB and budget SKUs of the GTX 1070, although the older cards will remain on the market as stock is cleared through the channel. Unlike the RTX 20-series, NVIDIA have opted not to release a Founders Edition of the GTX 1660Ti. Instead partners will be producing their own variants across the board, complete with custom PCB, non-reference cooling and optional I/O. The model we're reviewing for this launch is a real treat: the ASUS ROG STRIX GeForce GTX 1660Ti. ASUS ROG STRIX models typically push the envelope of performance and build quality no matter the range, and each has their high-end triple-fan cooling solution that incorporates customisable RGB lighting into the shroud. No matter the manufacturer each GeForce GTX 1660Ti has a TU116 GPU at its heart. Roughly analogous to a TU106 that's been on a heavy diet, it's a slimmed down GPU with approximately two thirds the number of shaders and no advanced RTX features. That means no real-time ray tracing or advanced AI features such as DLSS, but does help it stay within a more affordable price range. Cunningly, rather than inherit RTX 20-series naming conventions, NVIDIA have opted to re-use GTX and place the series number squarely between the 10-series and 20-series. That draws an immediate contrast between it and cards from other series, helping to inform consumers of what they should and shouldn't expect. NVIDIA have come in for a lot of criticism for confused naming schemes recently - most notably the four different GTX 1060 SKUs - and so in our mind this is a very welcome change of pace. At least one headline Turing feature does make it into the GTX 1660 Ti though. The card makes use of 6GB of the newer and considerably faster GDDR6 memory, bolstering bandwidth while maintaining a good sized frame buffer for 1080p gaming. That's a welcome addition considering industry concern that GDDR6 would balloon the price beyond affordability. The chief advantage of ROG's STRIX GeForce GTX 1660 Ti is in its advanced cooling solution and factory overclock. ASUS push the card to an impressive boost clock of 1890MHz, up from reference speeds of 1708 MHz (>10%), on the back of its triple-fan cooler. This cooler has also been tweaked for better air flow without increasing noise, while a switchable BIOS allows the user to configure with performance or silent mode presets. Fans of low-noise computing will be pleased to know that the silent mode will even stop fan rotation entirely under low temperatures, which is a pleasant addition if your system doesn't just serve as a gaming machine 100% of the time. As the name implies, the GTX 1660Ti is something of a generational mid-point between the GTX 1060 6GB and RTX 2060. As with prior mainstream releases NVIDIA are aiming to satisfy consumers who currently own similarly positioned cards that are a couple of generations (3+ years) old. In this instance that means the GTX 960, a workhorse card in its time but showing its age even at 1080p. 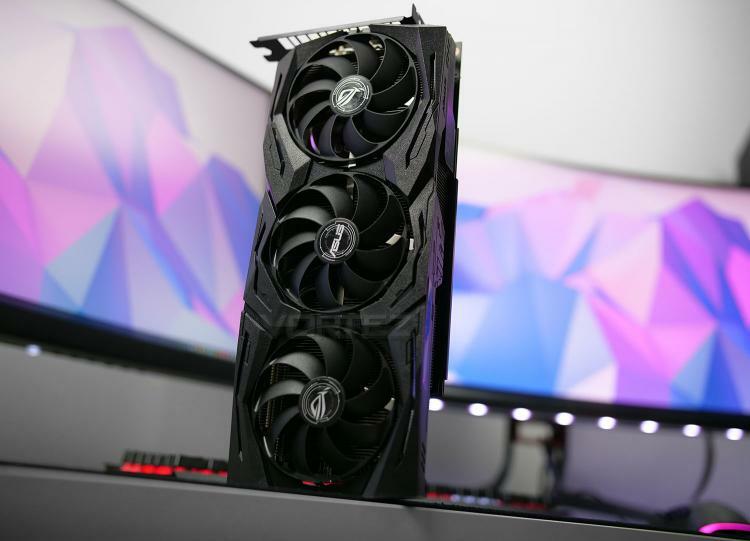 Now it's time to take a closer look at the ROG STRIX GeForce GTX 1660 Ti and see what competitive advantage it offers as a premium variant of NVIDIA's new series.